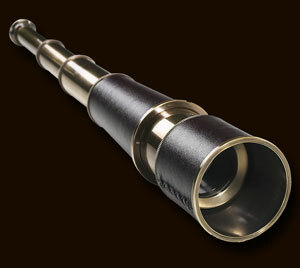 Ref: KA023 Made to store away as small as possible this is a marvel of hand tooled telescoping brass tubes. Pull out all the way and focus by adjusting the smallest eye-section. Feel like a sea captain scanning the horizon from a heaving aft-deck. Leather covered. Bronze finished.